The Altima is equipped with a 2.5 liter, 182 horsepower four cylinder engine with Xtronic Continuously Variable Transmission - which is responsive and exceptionally seamless. All of this riding on 17" Aluminum Alloy wheels. What a wonderful car to drive - the acceleration, decisive handling and overall performance just make this a premier choice in its class. Power comes from a 2.5 liter, 182 horsepower four cylinder with a the Xtronic CVT (continuously variable) transmission. Altima has always had a more sporty feel and stronger handling than just about any of the other intermediate family sedans, except perhaps Honda's Accord. This year's model follows in that tradition admirably. A good choice for somebody who doesn't want to be bored to death driving around. 38 highway mpg / 27 city mpg per gallon. Altima gets a pretty striking 31 miles per gallon overall, and 38 miles per gallon on the highway! City mileage is 27 miles per gallon. The government says the 2.5 liter, 182 horsepower, four cylinder engine that powers the Altima 2.5 SL that we drove uses 3.2 gallons of gasoline per 100 miles. Ranked near the tip in the family/mid-sized sedan classification, it's no wonder. Priced $1,000 below the average price of a car today, yet it offers so much. Nissan continues to dazzle with the Altima, taking sophisticated design and queues not just from the Maxima but from its up-brand, Infiniti. For starters, the NASA-inspired "zero gravity" front seats. The idea with the NASA-inspiration is that his technology offers maximum and ideal posture - especially for longer trips. Thus, also avoiding fatigue when traveling. Coupled with the 8 way power drive leather seat and lumbar support, this makes for a VERY comfortable driver's ride - local or countryside. The aggressive Altima is an eye-catcher and show stopper. Few rival this sedan for style, performance, handling and safety - all components of this family sedan are running on full speed. Soft, plush-touch materials leave the drivers senses heightened. From grill to gas milage, the Altima is a winner. The only drawback in the Altima is the rear design which impacts rear headroom - in other models as well. The 2014 Altima is what it always has been: Roomy, ultra quiet, and a car that appeals to the performance minded family person. Only Honda's Accord and to a slightly lesser extent, the Ford Fusion, can go to the mat with Altima on the performance angle. If you're wondering how to position Altima among mid-sized sedans, think of it as a value/sophistication proposition. Value is relevant here because the Altima, with a base price of around $21,860, is less expensive than all but a handful of the midsized sedans on the market. And sophistication comes into play because experts in the mid-sized sedan market data say that Altima buyers pick it because they are looking for something upscale and elegant, with a bit more to separate themselves from the other mid-sized products, and also because the car is a strong performer on the road. Driver and Front Passenger Side Impact and Curtain Air Bags, LATCH, ABS, Vehicle Dynamic Control, Tire Pressure Monitoring System, Vehicle Security System, Vehicle Immobilizer System. Blind Spot Warning and Lane Departure Warning are both fabulous features in a family car like this. All the usual airbags including the side impact and curtain airbags. Also has vehicle dynamic control, traction control, a four wheel anti-lock brake system, tire pressure monitoring system, etc. Plenty of tech in this vehicle and a very attractive and spacious dash and cabin makes room for it all. Bluetooth for safer driving is standard. Push Button Starter. Nissan Connect App system comes with Facebook+Pandora for personalized music streaming and other customized downloadable apps. Altima's rear-camera assist is one of the best, giving the driver not just the traditional rear-view, but also a straight-down 360 of the car, for a panoramic perspective - which is critical when backing up. Jam time is all the time with Sirius XM and listen to great sounds with eh Bose nine speaker sound systems. One of the best features of this car? A remote starter system! Who isn't going to love, appreciate and use that! The 2014 Altima SL price included the following standard equipment: Aluminum alloy wheels, eight way power leather seats with a heating system for front passenger and driver, a heated steering wheel, cruise control, a nine speaker Bose audio system including woofers, Sirius XM Satellite radio, BlueTooth, dual zone automatic temperature control, rear air conditioning vents, remote start system, power doors, locks, windows and seats, push button ignition, automatic on/off light system, LED taillights, chrome exhaust features and other items. We had no problems at all with the Altima. But we do note that Consumer Reports predicts that the Altima would have "much worse than average reliability" with the main issue found on 2013 models being body part integrity. However, to be fair, we would also note that we saw absolutely no evidence of that, or any other fit and finish issues on our well-built example. 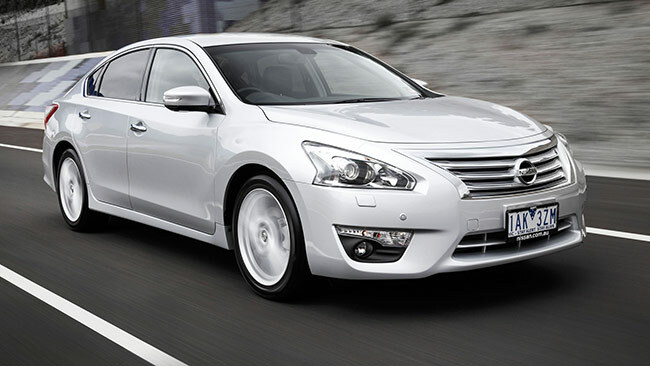 Muscular and smart, the Altima's wide stance and distinct lines moves it to the front of the class. I like it a lot. The semi fastback roof design, the aggressive front end and the sense of presence in the side profile suggest a sleek, sporty sedan. But--I would also say that the next generation of Altima's, I hope, will have a new overall styling theme, because this one has been around now for some time in several generations of being on the market. Got to stay competitive! 3 year/36,000 mile Bumper-to-Bumper. 5 year/60,000 mile powertrain warranty. The 2014 Nissan Altima comes with a three-year/36,000-mile bumper-to-bumper warranty and a five-year/60,000-mile powertrain warranty.